Climbing vine with fragrant blooms. 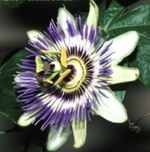 The outer petals are white and the inner ones purple-blue. Blooms mature to form edible orange fruits (blooms are edible as well). Tolerant as to soil types, but does best in a well drained loam. Hardy to 10F (-17.7C); height: 15ft. Vine with pink petaled blooms followed by edible fruits. Hardy to -10F (-23.3C); height: 15ft.